Flint Premieres on Lifetime This Saturday; Will It Show Us the Outcome of the Ongoing Water Crisis? It has been 1,278 days since the residents of Flint, Mich., had clean water flowing through their pipes. The problem has still not been fully resolved, and government infighting between the city and state has led to more red tape and more delays in finding a permanent, clean water source for the city. 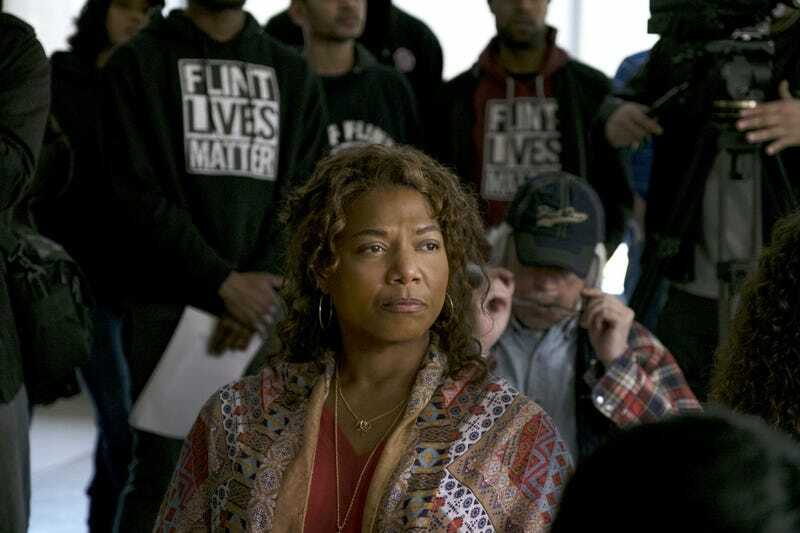 As the city’s water problems slog on, Lifetime is set to premiere its made-for-television movie that dramatizes the crisis—the eponymous Flint, starring Queen Latifah (who also executive-produces), Jill Scott, Betsy Brandt and Marin Ireland. Flint is a dramatic retelling of the crisis that focuses on the whistleblowers who helped expose the city’s lead-contaminated water. LeeAnne Walters (Brandt), Melissa Mays (Ireland) and Nayyirah Shariff (Scott) discover that the water is contaminated and causing medical problems for their families. When their complaints to the powers that be go unacknowledged, they band together to expose the corrupt government officials whose greed and carelessness caused the crisis in the first place. The film is based on the Time-magazine cover story “The Toxic Tap” by Josh Sanburn. The screenplay was written by Barbara Stepansky, and the film was directed by Bruce Beresford. In addition, Lifetime partnered with the United Way of Genesee County on a public service announcement starring the cast of Flint and encouraging people to donate to help the city’s residents. According to Lifetime, the funds raised will be used to help purchase bottled water and filters as well as provide for the long-term health and developmental needs for the children of Flint and their families. Flint will premiere Saturday, Oct. 28, at 8 p.m. on the Lifetime network.